Celebrating its 28th“Best of America” National Juried Exhibition, the National Oil & Acrylic Painters’ Society (NOAPS) invites oil and acrylic painters from all across North America and International Artists to apply to our exhibit honoring the Best in oil and acrylic painting. NOAPS has been showcasing the talents of oil and acrylic painters since 1991. All NOAPS members: 18 years of age or older residing in the United States, Canada and Mexico. Other International artists may apply but please take into consideration shipping and custom fees since this is a gallery show. · The ‘Best of America’ is a juried competition open to members of NOAPS. All entries will be submitted via Juried Art Services (JAS) www.juriedartservices.com. JAS is a free service and provides a comprehensive ‘Help’ menu. NOAPS is also available to help with procedural problems. Email: Membership@NOAPS.org for assistance. · Digital files should be saved in universal .jpeg format for JAS entry and should be between 1400 pixels and 4000 pixels longest dimension at 300PPI (pixels per inch). · Not previously accepted in any other NOAPS Exhibit (including NOAPS National Exhibitions, and Fall and Spring International Online Top 150). · Maximum size of the art excluding frame shall not exceed 1200 square inches (Example: 30 x 40 in= 1200 square inches). 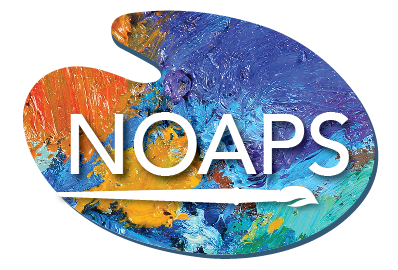 · NOAPS is dedicated to exhibiting excellent works of fine art which promote the artist’s artistic ability, vision and creativity within the traditional art forms of oil and acrylic painting. In this respect All artwork should be original and created from conception to completion by the artist in Oil and/or Acrylic only. Artists are permitted to use their own photos as reference materials in the creation of their artwork. No mixed media, painted giclee prints, or any other type of digital or photographic reproductions in conjunction with the Oil & Acrylic qualify. No artwork copied from other artists work or published photos, or created in an instructional setting are eligible. The annual 2018 NOAPS membership of $50 is required if you are not currently a member pay the membership fee through the membership link at https://www.noaps.org/join-us or when entering this exhibit. · The annual membership is valid from January 1st to December 31st of each year. · To verify if you are a current 2018 NOAPS Member, please check our Members Directory Page. https://www.noaps.org/member-directory A 2018 will be listed after your name if you are a current member. The fee to enter is $30 for the first image and $10 for each additional image UP TO A MAXIMUM OF 5 IMAGES. · Example: maximum of five (5) entries= $70 plus current 2018 NOAPS membership if not already paid. Payment may be made by Pay Pal or Credit Card. Each entry is reviewed and scored by an independent jury panel. The Jurying panel will consist of a minimum of 5 NOAPS Master Artists or Signature Members. The panel selects paintings for the exhibit based on the quality and individual mastery of the medium. IMPORTANT: Jurors in the panel make selections based on the image entered (make sure the image depicts a true representation of the painting). Jurors score the image only and do not see any information about the artist. once Signature Status achieved, the awarded artist may use the initials NOAPS on original works of art and in their correspondence. Master Artist Membership: Master Qualification begins AFTER Signature status is attained. Master Artist Membership is awarded to active members, whose dues are current. · These TOP Qualifier Awards will be clearly identified as Masters Qualifier Awards before the start of the Best of America Exhibit. They include Best of show, 1st, 2nd, and all “Best of” category awards. · With 2 Nationals per year, there will be 10 opportunities in a 5 year period to qualify for Master. · Upon approval of the Masters jury submission committee and Masters designation is received, the awarded artist may use the initials NOAPSM on original works of art and in their correspondence. This honor is awarded for life, unless forfeited by nonpayment of annual dues or resignation. Artists selected for the Exhibition will be notified by email from Juried Art Services. An up to date email address is essential for notification. Upon receipt of the accepted paintings at the exhibit location, NOAPS and the Gallery retain the right to refuse to display and/or allow award judging due to: technical inaccuracy, misrepresentation, inadequate framing, or damage from improper packaging. · NOAPS strongly recommends Strong Boxes from Airfloat Systems. (They are NOAPS Sponsors and they provide a 20% discount to NOAPS members). Similar shipping container can also be accepted. All art received and displayed will not be returned until after the exhibit has closed. IMPORTANT: Once accepted, failure to send the accepted artwork to the exhibit will result on a two (2) year disqualification period for the artist. · If the artwork is sold after acceptance but before shipping it to the exhibit, commission should be paid to the art gallery. · Selected paintings will be showcased on www.NOAPS.org, in the NOAPS Blog, and in NOAPS Social Media. · By entering, entrants are consenting to having a reproduction of their work used for promotion of the NOAPS Exhibits. You are confirming the work entered is your own and copyrighted images incorporated in your work have not been used. All entries must be for sale. Paintings of all price ranges are accepted. Entrants price their work and should closely represent the established market value of the artist’s work. The price entered on the Juried Artist Services application form will be the price for the duration of the exhibit. Every reasonable care will be exercised with all artwork. NOAPS, The Gallery, and any other organization or individual connected with the exhibition will not be responsible for loss or damage of artwork while in transit. By entering this exhibit, the applicant agrees to the terms and conditions of the prospectus. The artist will receive 55% of the selling price, with the remainder split at 45% to the hosting gallery. Once your art is accepted into the Exhibition, please follow the shipping instructions carefully. Full shipping instructions will be provided with acceptance letters. All shipping charges to and from the Gallery are the responsibility of the artist. We recommend insuring your work before shipping. 2. HOW TO Create a return shipping label - example - If using UPS - Must open an account with them, then use their online program to "Create a return" - Enter all the information and print the label but do not schedule a pickup. Enclose return label in envelope for the gallery. There are no charges until the shipping company driver picks up the parcel and scans the shipping label. ***Artwork will not be displayed if Return Label is not provided. 3. $30 check made payable to Eisele Gallery of Fine Art for unpacking/repacking fees. 4. Hand deliveries DO NOT require a handling fee. Your participation and support of the NATIONAL OIL & ACRYLIC PAINTERS’ SOCIETY is greatly appreciated. We wish you success in this event and may all your art career goals be met!